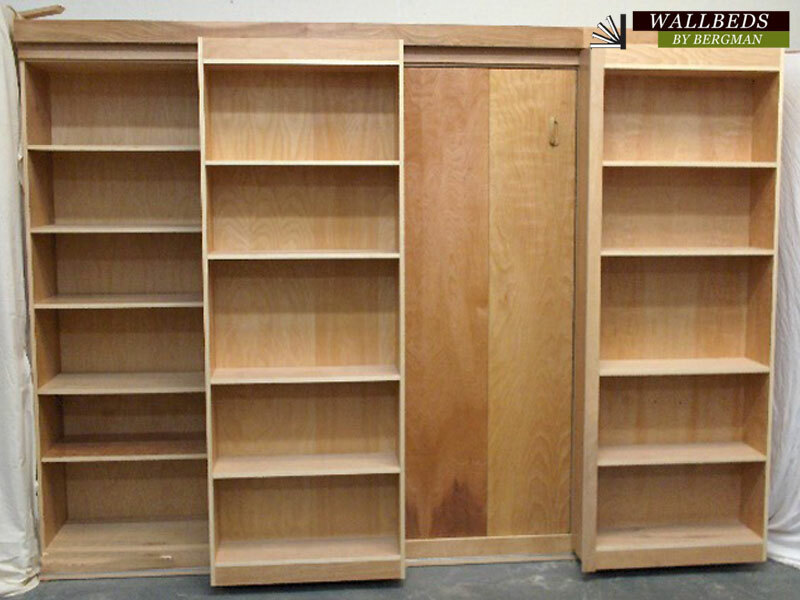 The library panel bed kits are made out of 3/4 inch cabinet grade birch or oak plywood, and edge banded with birch veneer. We use a steel continuous track on the base of the cabinet, and six steel rollers with ball bearings per sliding cabinet rated at 60 pounds each. If you anticipate heavy books in excess of 240 pounds we can add more rollers. The rolling shelves are locked in place so they won't come off the track. The metal frame is bolted to the cabinet base so only the cabinet is attached to the wall at the top. This unit seconds as an entertainment center, gun cabinet or hidden doorway cover, or hide anything behind it. 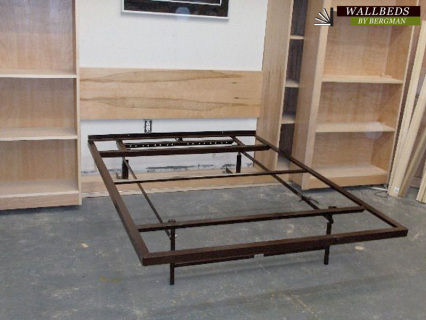 Our wallbeds are absolutely the very best do-it-yourself kits on the market today, and we've built and installed over two hundred of these beds. 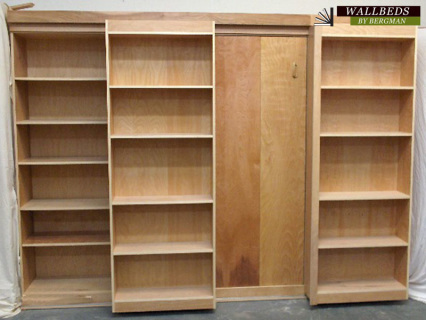 We make our standard bed cabinets out of cabinet-grade 3/4 inch birch, maple or oak plywood. Higher grades are available upon request and special orders can be made out of cherry or walnut. No finish is applied to the wood on these units, and if you intend to paint it we recommend ordering birch because it has a tighter grain. All exposed edges are edge banded with real wood and every exposed part is sanded smooth. All metal parts are coated with three coats of paint and black powder coating on all steel parts.The flip over leg is rated to hold 1000 pounds. All wood parts are numbered to match the packing list and pre-drilled. We provide a pictorial assembly and installation manual that is very comprehensive, plus you can call for personal attention if you are having difficulties. All wood parts are held together by square drive pocket screws and assembly is fairly easy if the instructions are followed in sequence. Two 10 inch clamps. Nice but a helper would do, maybe. Kit price: $3,400.00 This kit is not sold with the bunkie board or 1/2 or 3/4 inch plywood screwed to metal frame (mattress foundation). Dimensions: 130 inches wide by 92 1/2 inches high. The bed cabinet is 15 1/4 inches deep with 3/4 extra trim to make 16 overall. The side cabinets are 12 inches deep and the rolling cabinets are 9 inches deep. Please allow 3-6 weeks for the library bed. Dimensions: 121 inches wide (119.5 inches at the base) by 88 1/2 inches high. The center bed cabinet is 15 1/4 inches deep by 85 inches high and 59 inches wide, the two sides are 12 inches deep by 30 inches wide by 85 inches high. The rolling cabinets are 9 inches deep by30 inches wide by 82 1/2 inches high. Kit price: $660.00. Includes complete plans and hardware to build a full size library panel bed. Online price includes ground shipping cost of $60 within the US. For local delivery or pick up, or shipping outside the US, please contact us before placing your order. Dimensions: 119 1/2 inches wide by 88 inches high. Heavy duty American made powder coated hinges for mattress compartment. American made solid (not hollow tube)powder coated metal flip over leg. This unit at the bottom is 130 inches wide, with the upper side trim that returns to the wall it becomes 131 1/2 The rolling cabinets are 9 inches deep the side cabinets are 15 1/4 or 12 inches deep. I will put three coats of water based poly on this unit for $650.00 and stain it a color for $250.00 Lights are 165.00 as of today. 4-6 weeks for delivery depending on order volume. Custom arrangements available. We use a 11/16 stainless steel continuous track on the base and top of the cabinet.This track can be painted to match the cabinet. We use six steel rollers with ball bearings per sliding cabinet, these are rated at 60 pound each, these rollers (wheels) are 1 3/16" diameter sheaves. I mortice four of these wheels into the bottom of the rolling shelves. The upper track I mortise in two sheaves. The rolling shelves are 30 inches wide by 10 inches deep. I rabbit out the back end of these vertical panels for the 1/4 plywood backs,. 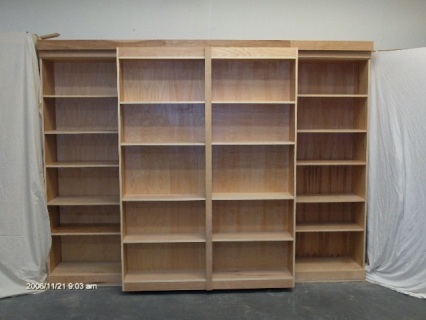 The full depth of the shelves for the rolling cabinets is 9 inches for books, and the side cabinets are 15 inches deep. I build a floor base for the whole unit 130 inches long . On the very end of front of the cabinet runs a stainless steel track 5/16" high by 11/16" wide. This track and rollers are made to hold 300 pounds. The same track runs at the very top of the bed, with trim covering it up. This makes the rolling shelves locked in place so the won't come off the track.If for some reason the shelf should become detached from the upper track I have installed a scalp or trim that comes down over the sheaves so as to block the cabinet from falling forward away from the wall.The scalp is attached to a piece of plywood with the track on it, it runs continuous across the front of the unit and is screwed into the top of the vertical panels and front braces with 1 5/8 screws. This unit comes with 1/4 birch plywood backs on all four cabinets. We now offer this unit finished with 3 coats of poly for $600.00. We now offer this unit shipped common carrier as a pre assembled kit with most parts assembled. Please call for quotes for your area.505-286-0858 and cell 505-470-8902. This unit is shipped by Fed-Ex in Boxes of less than 80 pounds, for a total weight of about 500 lbs. Prices vary up and down over time with different add-ons. Dimensions: The unit at the bottom is 130 inches wide, with the upper side trim that returns to the wall it becomes 131 1/2. The rolling cabinets are 9 inches deep and the side cabinets are 15 1/4 or 12 inches deep. We now offer this unit finished with 3 coats of poly for $600.00. Please call for quotes for your area.505-286-0858 and cell 505-470-8902.